Every traveler knows that money is only as good as what it can buy. What you find on the dollar menu on one side of the border may cost $2.05 on the other. A lack of this purchasing-power-parity perspective is a major flaw in standard comparisons of annual defense spending. Analysis of the U.S. and Chinese defense budgets should not concentrate on dollar-vs-dollar, but rather the meat of what those budgets can buy. 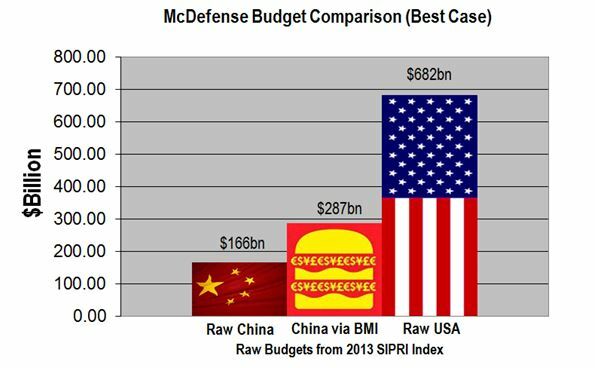 For a quick non-scientific assessment of defense budgets weighted by purchasing-power, we look to the Big Mac Index (BMI, no pun intended). In 1986, the Economist developed the BMI as a humorous way of gauging the accuracy of currency valuations world-wide. What started out as educational humor became a serious academic endeavor. The BMI is so effective that the infamous currency manipulating government of Argentina’s Cristina Fernández de Kirchner has passed laws regulating the sale and marketing of the Big Mac. Although the Economist has produced a “gourmet” version controlling for local factors such as differences in labor costs, it is those local market defects that make the raw BMI appropriate for defense budget analysis – the analysis is not of currency on the exchange floor, but on the shop floor. According to the Stockholm International Peace Research Institute, China‘s raw defense budget of $166 billion is a mere 24% of the American defense budget at $682 billion (including so-called OCO funds for the Iraq and Afghanistan wars). In order to gain the purchasing power perspective, we can compare the budgets using the respective countries’ Big Mac Index prices – $2.61 in China and $4.56 in the United States. Weighted with the BMI, China’s defense budget value is 42% of its American rival, the equivalent of $287 billion. Depending on what source you use, the comparison worsens. A raw dollar-to-dollar comparison of DOD’s maximum assessment of China’s defense budget ($215 billion) and the U.S. budget without war funding ($593 billion) shows China at 35% of the U.S. level. Once you weight the budgets with the BMI index, the Chinese defense budget emerges at a robust 63% of the U.S., the equivalent of $376 billion. 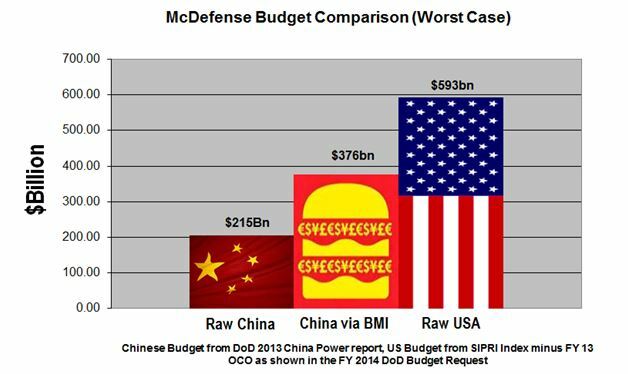 The BMI is by no means a perfect method of showing the value-for-money comparison of Chinese and U.S. defense budgets. After all, burgers aren’t bombers, and fries aren’t frigates. But using such purchasing power parity measures provides a useful perspective as the dirge of sequestration starts to play. The BMI illustrates how the value-for-money calculation tilts toward China. So, too, are the missions and challenges to which the value is applied. Because of its extensive cyber program and other means of industrial espionage, China must spend far less on R&D as it steals and copies designs and doctrines from its more advanced competitors. China’s anti-access/area denial (A2/AD) focus provides a financial asymmetry as well as a technological one. After all, a DF-21 “carrier killer” missile is far cheaper than the U.S. supercarrier it’s designed to strike. Secretary Hagel has noted that half of U.S. defense spending is obligated to pay, benefits, and retirement – not training, supplies, capital investment, procurement, or R&D as many assume. China does not treat their personnel nearly so well. Moreover, these “people costs” are consuming an increasing share of the defense dollar. Army Chief of Staff Ray Odierno recently predicted that compensation would consume 80% of the Army’s budget by 2023. The BMI does hold out one glimmer of hope: the McDonald’s Theory of International Relations holds that no two nations hosting a McDonald’s franchise will ever go to war. But in the Asia-Pacific of the 21st Century, the United States cannot afford to rely on Mayor McCheese to guarantee the peace. LT Matthew Hipple is the Executive Officer of PC Crew INDIA and the Director of the NEXTWAR blog. He is also a member of the U.S. Naval Institute and a contributor to Proceedings. While his opinions may not reflect those of the United States Navy, Department of Defense, or US Government. This article was originally posted at Real Clear Defense.